Challenge (for college assignment): Through working on healthcare accounts, I learned about the six million or more unpaid caregivers in Canada. Many of these caregivers are 45 to 65-years-old and oversee a senior citizen parent/other loved one’s care, while building their own career or family. Through caring for my healthy 91-year-old mother, I too lived the challenge of finding trustworthy answers about varied issues — from hearing aids to memory loss. Digging further, studies show: Caregivers, particularly those in the ‘sandwich generation,’ get less sleep, are stressed and often miss work. As I discovered the best support solutions for my mother through word-of-mouth, I wondered ‘what if’ there was a channel for caregivers to save research time by learning from each other? Armed with this insight, I pursued a social network for unpaid caregivers as a senior project for my interactive media management course. Implementing a Solution: To assess this challenge, I conducted a qualitative user survey, an optimal user card sort, as well as a comparative analysis. I didn’t find any North American-based social network dedicated to unpaid caregivers of senior family members/loved ones. To create a solution, I completed the development tasks outlined below. You may download PDF copies of each highlighted deliverable to review in more detail. 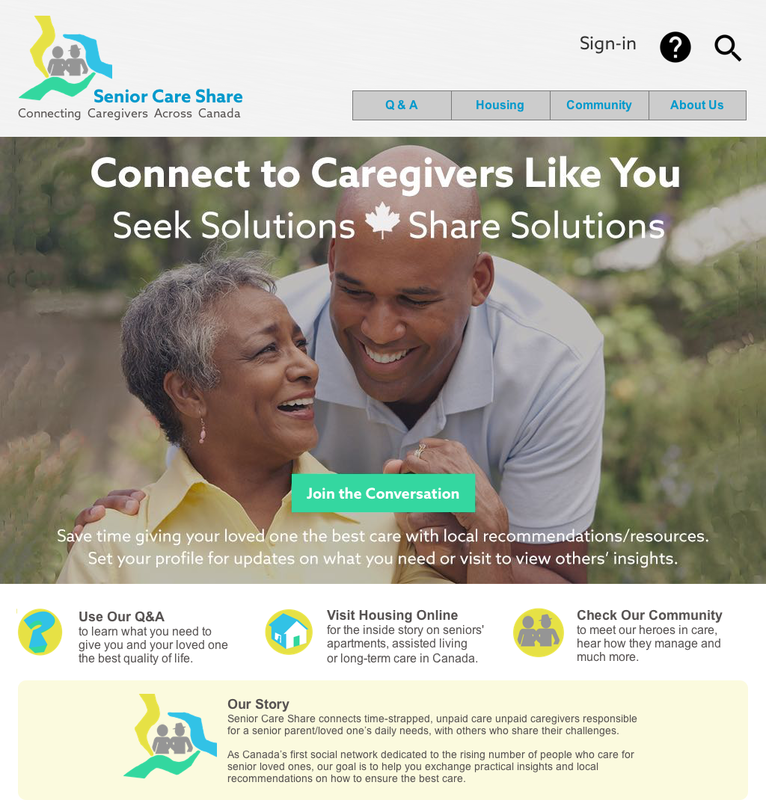 Referencing the research, I developed three personas for a niche social network, called Senior Care Share. Its vision is to connect time-strapped, unpaid caregivers responsible for a senior parent/loved one’s daily needs, with others who share their challenges. To lay the framework, I developed user scenarios, functional specifications and analytics targets. I integrated these components with background research in a business and marketing plan. Mock-ups of evolving prototype screens with ‘mobile first’ approach. 1. Q&A Discussion Forum for users to post and answer practical questions in searchable categories. It includes up-voting functionality to streamline and promote the most useful content. 2. Rate My Senior’s Housing module for users to search, review and rank seniors’ housing options by set criteria, as well as enter review comments and photos. 3. Community for users to ‘virtually’ meet community members, access online information, as well as interactive resources and useful links. Results: Development is ongoing but to date, the concept is resonating among the target audience, UX and digital professionals. It represented Centennial College in the ‘Best of the Best Student Showcase’ at Digifest 2015, where judges anecdotally cited it among the top three submissions in the app category. This project earned a grade of 96% as the senior assignment for Centennial College’s interactive media course.